World Vision is committed to partnering with the people of Armenia to improve their lives today and to help deliver sustainable solutions for the future of their children, families and communities. 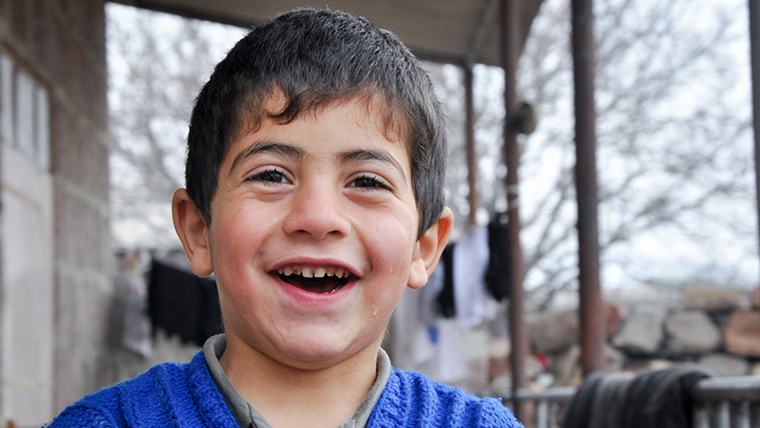 Please pray for our work with the poorest children in Armenia. Nelly is just 8-years-old. In April 2016 she was forced to flee from her home with her mother, father and four siblings to a remote community in Northern Armenia. Nelly’s home was destroyed by conflict. Devastated and destitute her family arrived at their new home in Northern Armenia. When they arrived the village mayor gave the family a small house to live in and we were able to help them access government support. Nelly’s mother, Anna, uses the money she is given to support her children through school in the hope that they will complete and be able to get a job. “Everyday mum washes our clothes so we can go to school clean. I hate it when she is doing handwashing. When it snows the clothes don’t get dry and mum gets angry about it. It snows often, I like it but I wish it wasn’t so cold. We heat the house in the evenings only when it gets really really cold and we go to bed early so we are warm under the quilt. Making a home in their new village has been difficult for the family and with another baby on the way their finances will be stretched even tighter. Nelly still has dreams of her own even though life is tough. 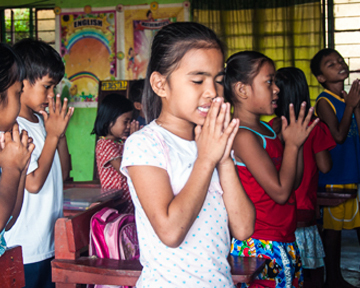 Pray that Nelly and her brothers and sisters will find a new passion for school and their studies. Pray for the safe delivery of her newest sibling and that her family would be able to support themselves. Ask God for work opportunities for her father so that the financial burden on her family would ease. 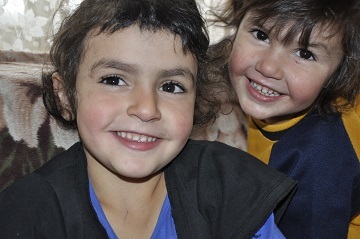 Pray for wisdom for our team in Armenia in knowing how to support families like Nelly’s. Hayk is five years old and suffers with a thyroid gland cyst. Three years ago he had an operation but hasn’t fully recovered. He lives with his mother, grandfather, sister and brother. The family live in very poor conditions. His parents are divorced. Please pray for Hayk’s recovery and pray for better financial prospects for the family so that they can have their basic needs provided for adequately. We give thanks to God for Angelina. She is 12 years old and is autistic. Her mother is now in employment and is earning money. Angelina can now go to school and is making progress communicating with her peers. Pray for our staff and our supporters to be mentally and emotionally prepared and focused on our work for the sake of the most vulnerable children we serve. Madora is 12 years old and suffers from lymphoblastic leukemia. The illness makes her feel very sick and weak. She lives with her parents, sister and brother. Unfortunately her parents don’t work and the family live in very poor conditions, in Madora’s grandma’s house. Please pray for healing for Madora, as she struggles with her illness. Pray that the family’s financial circumstances improve so that they can get good medical care for her and provide properly for the whole family. Erik is 15 years old and suffers from eozinofilic granuloma (a highly inflammatory skin condition). His family are very poor but initially found the money to pay for some medical treatment as his health was declining rapidly. Now he needs an operation but the family cannot afford the cost. Please pray that God has mercy on Erik and grants his family the funds to get him the operation he needs so that he can be cured and live a healthy, normal life. We thank the Almighty Lord for healing 18-year-old Arpine, who was diagnosed with breast cancer. She was operated on with the support of World Vision and the operation was a success. Arpine has recovered very well. We give praise and thanks to God and all those who prayed with us. We also thank God for the father of one of our families. He is an alcoholic but has stopped drinking. We’ve been helping him on the road to recovery and we are very grateful to all those who prayed with us for him. He’s now able to give attention and care to his family and is trying to improve their financial situation. We thank God for each day we live and every chance He gives us to make our world a little bit kinder and brighter. Nare is 5-years-old. She suffers with cerebral palsy and cannot walk. She was operated on last year and a plastic device was placed in her femur to help her to walk. She is now going through a rehabilitation course to teach her to walk. Nare lives with her parents and sisters. Please pray for Nare, so that she is able to walk one day and also get the support and care she needs to manage her illness. Narek is 5-years-old. He is suffering from a sensory processing disorder and development delay. This means he is not able to speak. He lives with his parents and his brother. The family are very poor and their home is dilapidated. Please pray that God will provide and help Narek to be able to speak. Pray that his family can access good medical help for him so that he can have the best life possible. Elona is 6-years-old. Her family home recently burnt down and her family are now homeless. She lives with her mother and stepfather in extreme poverty. They were not able to save any of their possessions or important documents. The head of the community has temporarily allocated a vacant house to the family so that they are not left out in the open air. Please pray that this vulnerable family will once again have their own home and will not have to move from shelter to shelter.